Bring the water and salt to a boil and steam the beans for 5 minutes. 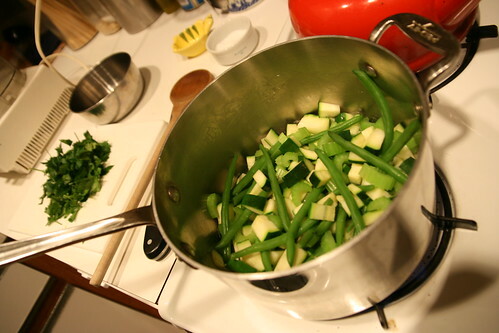 Chop the celery and zucchini and add to the pot. Cook for an additional 5 minutes (or until all of the vegetables are tender). Pour into a food processor and puree. Add the parsley and olive oil. Puree the hell out of it. The result isn’t the best tasting recipe in the world, but it’s a lovely green color when it’s done and I get the feeling that it’ll do great things for me. The consistency isn’t what I would call “pea soup” because the parsley is still rather crunchy. Try at your own risk. Next Next post: iPod Video (aka 5th gen iPod), We Hardly Knew Ye!